Amoonguss in game: 347 Who? Important notice! Pokemon Amoonguss is a fictional character of humans. Amoonguss (Japanese: ????? 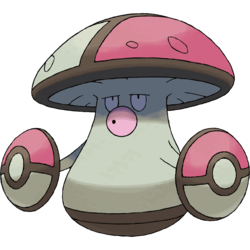 Morobareru) is a dual-type Grass/Poison Pokémon introduced in Generation V.
Amoonguss is a mushroom-like Pokémon with a large, light-colored Poké Ball designed cap with warts. It also has a huge gray, stem-like body, fierce looking eyes and a large pink mouth. Amoonguss wields two Poké Ball-like shields. It uses the Poké Ball-like patterns on its arms to lure in prey, though it doesn't work too well in most cases. 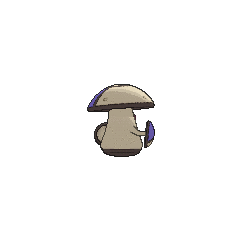 Amoonguss is a carnivore which can be found mainly in long grass, as only their mushroom cap head protrudes from it, generally close to water. James's Amoonguss first appeared in New Places... Familiar Faces!. Several Amoonguss appeared in The Four Seasons of Sawsbuck!. A group of Amoonguss made an appearance in Unrest at the Nursery!. A group of Amoonguss appeared in Team Plasma's Pokémon Power Plot!. An Amoonguss appeared in Foggy Pokémon Orienteering! when its rest was disturbed by Bonnie and Pikachu. 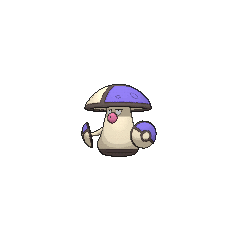 Angry to have been woken up, it uses Spore on them and later the other members of Ash's group after they do the same thing. In Lost at the League!, Cameron's Ferrothorn defeated an Amoonguss in the Vertress Conference. A Trainer's Amoonguss appeared in Cilan and the Case of the Purrloin Witness! competing in the Marine Cup Tournament. An Amoonguss appeared in a fantasy/flashback in The Journalist from Another Region!. A Trainer's Amoonguss appeared in Valuable Experience for All!, where it was defeated by Astrid's Mega Absol in the Lumiose Conference. Amoonguss appeared in The Uprising under the ownership of some Team Plasma Grunts. Bronius owns an Amoonguss where he used it to put Bianca to sleep with Spore. It had a battle with Black's Pignite, Nite, and lost due to the double type-disadvantage. Amoonguss has the highest HP base stat among all Poison-type Pokémon. 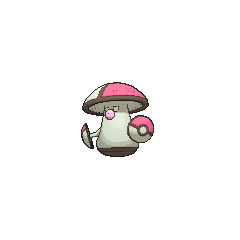 It appears to be based on Amanita muscaria or mushrooms of the Agaricus genus, due to it being Poison-type. 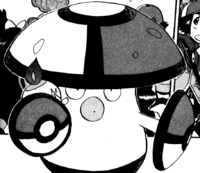 Its cap and the shield-like arms were designed to look like the front of a Poké Ball. Morobareru is a combination of ??? moro ni (completely) and ??? 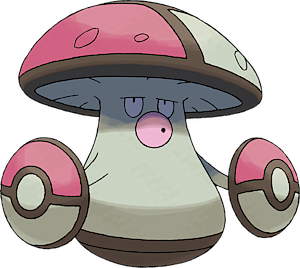 bareru (slang for "[for a secret] to be exposed"), referring to how it no longer convincingly looks like a Poké Ball. Korean ??? Pporokna From ??? ?, slang term for ???? Mandarin Chinese ??? Bàolùgu? From ?? bàolù and ? gu?